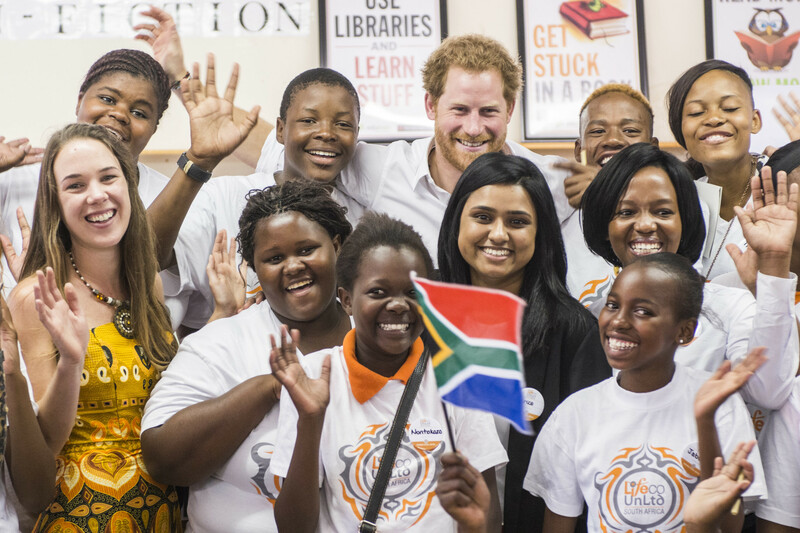 His Royal Highness Prince Harry has met with the inaugural South African winners of the 2015 Queen’s Young Leaders Award, ahead of the announcement of the 2016 winners on Tuesday 8th December. The Queen’s Young Leaders Programme was launched in 2014 by Their Royal Highnesses The Duke of Cambridge and Prince Harry on behalf of Her Majesty the Queen, to celebrate the achievements of exceptional young people, from across the Commonwealth. As part of his tour of South Africa, Prince Harry met with winners Emma Dicks, Noshipho Bele and Patrice Maduri at Siyabonga Secondary School, Soweto. He heard more about the work they have been doing in their communities over the last year and recognised them for the way they are inspiring change. At the school Prince Harry and the Queen’s Young Leaders Award winners also met with young people who have completed the ‘Nelson Mandela – The Champion Within’ training programme to empower students with the skills needed to succeed as leaders and entrepreneurs. The group then visited The Bus Factory in Johannesburg to meet young entrepreneurs participating in programmes to help them develop their business skills.